Against all odds, Sergio Moissen, socialist professor and aspiring independent candidate, managed to hand in more than 100,000 signatures to the National Electoral Institute (INE). This is the first time in decades that a self-proclaimed socialist will participate in an election in Mexico. After an intense campaign, Sergio Moissen and his running mate Sulem Estrada managed to hand in thousands of signatures to the INE in order to meet the institute’s strict requirements for anyone aspiring to be an independent candidate. This means they will be able to participate in the upcoming election for constituent delegates to write the new Constitution of Mexico City. The purpose of this article is to explain how such a feat was accomplished, what conditions were faced and what the tasks of the left are in this new phase. One of the last times a Constituent Assembly met and wrote a Constitution in Mexico was in 1917, two years after the forces of Pancho Villa and Emiliano Zapata took control of the capital city in the middle of the Mexican Revolution. During the 1917 session, the Constituent Assembly agreed that Mexico would remain a federal republic (as stipulated in the Constitution of 1857) and that the territory would be divided into 32 federal entities: 29 states, two territories (Baja California Sur and Quintana Roo) and the Federal District. Almost 100 years later, the Federal District would become a legal entity called Mexico City, the last entity to have its own constitution. The territories and the Federal District (which was the seat of power) were governed by a department, which was headed by a “Regent” chosen by the president. These departments had small populations and were governed through internal regulation, not by a local constitution. Baja California Sur and Quintana Roo were mostly inhabited by military personnel, but in 1974, due to population growth, among other things, then-President Luis Echeverría raised them to the rank of state, establishing a Constituent Assembly in their respective capitals that year. After the 1988 electoral fraud, in which the National Democratic Front’s [[Left coalition consisting of reformist parties and progressive sectors.]] candidate Cuauhtémoc Cárdenas (son of former president Lázaro Cárdenas) was allegedly defeated by the Revolutionary Institutional Party (PRI)[[The PRI was created in 1929 by then-president Plutarco Elías Calles under the name “National Revolutionary Party”, which was changed in 1934 by Lázaro Cárdenas to “Mexican Revolution Party”. In 1946 it was changed to its current name. The PRI governed Mexico uninterruptedly from 1929 to 2000.]] candidate Carlos Salinas de Gortari, the PRI government was in crisis due to profound discontent generated by the Salinas administration, decades of PRI rule and the practical impossibility for a party other than the PRI and its satellites to enter local and national government. The electoral fraud triggered a negotiated transition process in which the government agreed to give control of some municipalities and governorships to the opposition parties. In 1993, a political reform decreed that the “Regent” of the Federal District would be named “Head of Government of the Federal District” and that he would be elected by popular vote. The Democratic Revolution Party (PRD), which arose out of the protests against Salinas de Gortari, joined this process. As a consequence, the PRD candidate Cárdenas won the 1997 election and was named Head of Government. Because the Federal District now had an executive and legislative body that changed through elections, the entity was in a sort of limbo: it was not formally a state, but it could elect its leaders. In the 1990s virtually all major parties claiming to be anti-capitalist and left-wing were dissolved when they decided to join the PRD. Such was the case with the PRT (Workers Revolutionary Party, Mandelists from the USFI), the POS (Socialist Worker Party, Morenoite and then a member of the IWL), the old Mexican Communist Party (stalinists) and the United Socialist Party of Mexico. The latter party joined with the cardenist left of the National Democratic Front and the Democratic Current of the PRI, which claimed to be heirs of the “revolutionary nationalism” of the Mexican Revolution. 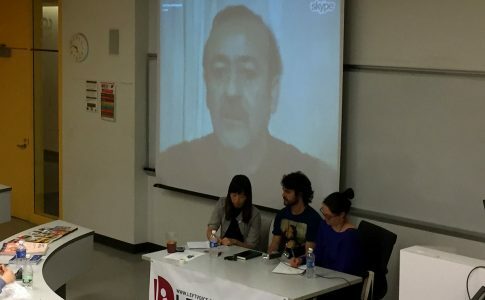 Thus, the PRD emerged as a combination of major reformist parties (with a minority of Trotskyist centrists) that presented itself as a “responsible left” under a reformist rhetoric with a clearly bourgeois program that advocated for the humanization of capitalism. At the same time, the emergence of the Zapatista Army of National Liberation (EZLN) in 1994 seduced most of the left that was critical of the PRD’s direction, with a strategy that set aside organizing the working class in favor of a struggle for the autonomy of indigenous communities. The EZLN shared the leftist position of those who accepted the idea of “the end of history” (which postulated the absence of the working class and the association of communism with Stalinism), leading them to a sectarian stance wherein they did not adhere to union calls for struggle nor did they express statements of solidarity because they considered unions to be “corrupt”, eclipsing their bases with their bureaucratic leaderships. Thus the third millennium began in Mexico with a rather minoritarian and fragmented anti-capitalist left, sometimes very sectarian and demoralized, which for one reason or another did not dare to participate in electoral processes. Throughout most of the early 2000s, the struggles in Mexico were centered on indigenous communities, popular sectors and “organized citizenship” (multi-class demonstrations and NGOs). The victory of the National Action Party (PAN)[[Officially the oldest registered party in Mexico, created in the 1930s by company owners, catholic sectors, fascists and right-wing students.]] and its candidate Vicente Fox in 2000 instilled hope in a “democratic renewal” that was never fulfilled due to the PAN’s agenda. In 2006, Mexico saw one of its most intense moments of struggle when inhabitants of the town San Salvador Atenco were brutally repressed by state and federal police for refusing to abandon their homes to make space for construction of a bigger airport for Mexico City; 26 women were raped by security forces and two people were killed in the clashes. It must be noted that San Salvador Atenco is in the State of Mexico, which was then governed by Enrique Peña Nieto of the PRI. Later that year, many saw the victory of PAN candidate Felipe Calderón in the presidential election as fraudulent, leading the main opposition candidate, Andrés Manuel López Obrador of the PRD, to demand a recount and call for a sit-in in the streets of Mexico that lasted for two months. At the same time, inhabitants of Oaxaca (led mostly by teachers) revolted against PRI governor Ulises Ruiz demanding better education conditions for their schools, which led to the “Oaxaca Commune”. However, most of these processes failed due to the lack of participation of workers (in the case of Atenco) or the absence of a vanguard party rooted in the working class (in the case of the electoral fraud and the teacher struggle in Oaxaca). Meanwhile, Calderón declared a “war on drugs” to legitimize his questioned presidency, which caused a wave of violence that still persists, with thousands of people murdered or disappeared, and with many women assassinated or kidnapped to be sold into sexual slavery through human trafficking lines. This barbaric spiral led to mass discontent towards the Calderón administration and his “war”, ultimately leading to the emergence of the Movement for Peace with Justice and Dignity (MPJD), led by poet Javier Sicilia after his son was murdered along with his friends in the city of Cuernavaca. Thousands of people participated in the MPJD, questioning the government agenda and calling for the end of the rising militarization. The movement that really set the tone for demonstrations over the last year was the #YoSoy132 Movement. In December of 2011, Enrique Peña Nieto participated in the International Book Fair in Guadalajara. When asked what his three favorite books were, Peña Nieto confused author names and book titles in a hilarious event that backfired for him, resulting in countless jokes and internet memes. In May 2012, when he visited the Universidad Iberoamericana (UIA, a prestigious university attended by middle and upper-class sectors), dozens of students decided to protest against his presence, questioning his actions as governor, particularly his decisions in the Atenco case. Pressured by the protesters, Peña Nieto left the event at the UIA, declaring that he “took personal responsibility of his decision to restore peace and order”. The fear of a return of the party that ruled Mexico for 70 years, combined with Peña Nieto’s ignorance on many topics (as exemplified by the incident in Guadalajara) and his justification for the use of repression (in a manner similar to that of president Gustavo Díaz Ordaz), led many students to demonstrate against his candidacy and the electoral machine supporting him. The #YoSoy132[[“I am #132” refers to a video of 131 UIA students responding to an accusation made the day after Peña’s incident by then-PRI president Pedro Joaquín Coldwell, who labeled the students as “porros” (hired thugs or false students). Outrage at this statement led the Ibero students to make a video in which they show their student IDs to prove they were actual students opposing Peña Nieto and not a group hired by his political competitors (namely AMLO).]] movement saw the emergence of a new generation of youth critical of the political establishment, using social media as a tool to coordinate actions, thereby joining Mexico to the youth demonstrations that were beginning to appear at that time around the world (the Arab Spring, the Spanish “Indignados”, the Syntagma Square demonstrations, the Chilean youth, Occupy Wall Street, etc.). Although Peña Nieto was victorious in the general elections, #YoSoy132 was the first step for many towards a life of activism and dissidence. 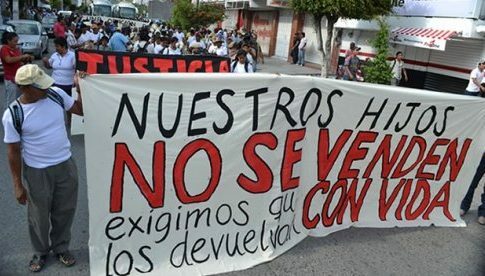 On the night of September 26th, 2014, 43 students of the Rural Normal School Raúl Isidro Burgos in Ayotzinapa were kidnapped in the town of Iguala (in the state of Guerrero) when they were trying to collect money to travel to Mexico City to participate in the yearly October 2nd demonstration[[A key demonstration of the student movement commemorating the massacre of students in the Tlatelolco housing section of Mexico City when they were attending a rally 10 days before the Olympic Games started in Mexico in 1968. Then-president Gustavo Díaz Ordaz declared himself responsible for the massacre and for all decisions leading up to it. He is remembered throughout history as a bloody repressor.]]. 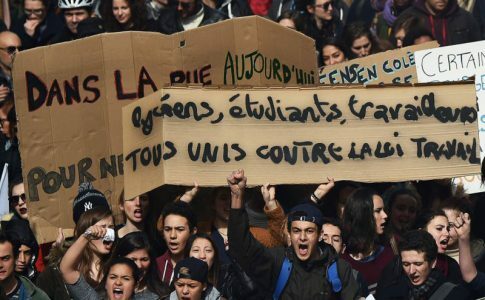 According to investigations, local and federal police, along with sectors of the army, handed the students over to members of organized crime who executed and incinerated them. The resulting outrage brought thousands to the streets for months and led to the arrest of Iguala’s mayor and the resignation of the governor of Guerrero. Lopez Obrador’s defeat in the 2012 elections led him to break with the PRD and to transform his “social movement”, the National Regeneration Movement (MORENA), into a political party. 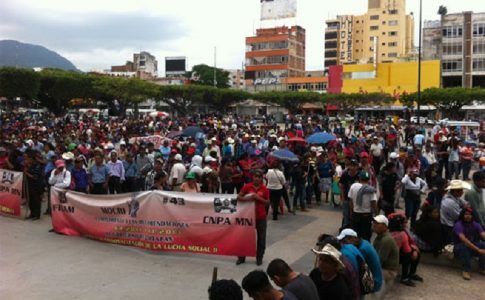 MORENA managed to channel the popular discontent that arose after the disappearance of the 43 normalistas, since both the mayor of Iguala and the governor of Guerrero belonged to the PRD. The Ayotzinapa crisis stripped the Mexican regime of any legitimacy it had and proved that it was associated with organized crime at all levels. The PRD’s support for the Mexican regime led many to break off and join MORENA: in the 2015 mid-term elections, MORENA received around 30% of votes for access to the Mexico City Legislative Assembly. 2015 was also the first time “independent candidates” participated in elections, including Pedro Kumamoto (a local activist) in Jalisco and Jaime “El Bronco” Rodríguez, governor of Nuevo León who has ties to regional company owners. Pretending to try to curb the rise of MORENA, the regime decreed a political reform that changed the name of the Federal District to Mexico City, raised it to a state-like level, and gave it a constitution to get it out of the “limbo” status we described at the start of this article. However, this “Constitution” is yet another undemocratic measure to prevent the expression of popular discontent with the Mexican regime that has been building since 2012. What is really at stake is the political heart of the Aztec country, contested between MORENA and Peña Nieto, who has the support of a sector of the PRD and Miguel Ángel Mancera (Head of Government of Mexico City and of the PRD). The undemocratic nature of the regime is evidenced by the fact that 40 of the 100 constituent delegates will be handpicked by reactionary figures like Peña Nieto and his puppet Mancera, both of whom have a long history of repression. Reducing the number of deputies elected through popular vote lowers the chances that new parties that criticize (albeit moderately) the lack of democracy in Mexico, like MORENA, will have a place in the Assembly. As noted above, MORENA won almost 30% of the seats in Mexico City’s Legislative Assembly, but with 40 deputies chosen between the president, the Head of Government and Congress, MORENA could only get 20% of seats, giving it a clear disadvantage against right-wing parties like the PRI, the PAN and the degenerated PRD, whose majority is ensured with their 40 chosen deputies (along with the deputies they gain through the general election on June 5th). In the first stage of the electoral process, those who sought to register as candidates had to obtain registration under extremely difficult conditions. First they had to establish an NGO, set up a bank account and complete countless bureaucratic procedures. Then they had to collect 74,000 signatures in one month (from March 1st to April 5th), which is equivalent to 1% of Mexico City’s electoral roll – that is more votes than a local deputy needed to win the mid-term elections of 2015 and is more than the 14,000 votes that ensured victory to the Magdalena-Contreras delegate [[Mexico City is divided in “delegations”, one of them is Magdalena-Contreras. What’s more, it was no easy task to gather those signatures. The signing person had to write their name, electoral code (from their election credential) and signature on the form. The INE would then verify that these signatures were made by real people in their database and that they really resided in the Federal District. The signature of anyone living in another state or of those who signed for more than five candidates would not be taken into consideration for this process. On April 17th the INE released a resolution stating that out of 38 independent candidacies that managed to stay in the race, only eight were approved, including the Anti-capitalist Platform. Under INE requirements, there is no possibility for the independent platforms to verify signatures nor to be part of the validation process, which is the basis for the legitimate right to call for the revision of decisions made by electoral authorities. Also, the fact that the resolution was made on April 17th – one day before the electoral campaign for the Constituent Assembly began – puts the independent candidates at a clear disadvantage against the registered parties. This left independent candidates with no time to prepare against the PRI, the PAN, the PRD and the MORENA, all of which have many more resources and a big apparatus behind them to deploy their campaigns for the Constituent Assembly elections. It should also be noted that the composition of the independent candidacies is not exclusive to one position, but rather there is a diversity of groups and interests that support them. The largest group is those who, although claiming to be independent candidates, actually represent the interests of the ruling political caste. This group has, for example, figures like Ismael Figueroa, leader of the Mexico City Firefighter Corps Union, who had no problem in gathering the signatures necessary for registration, since according to many testimonies, he forced each of the 2,000 firefighters in the union to collect 50 signatures under threat of being fired. Something similar happened with Xavier Gonzalez, nephew of Víctor Gonzalez Torres, a Mexican businessman known as “Dr. Simi “(in reference to the mascot of his pharmaceutical franchise, Farmacias Similares). There is also the case of Lorena Osornio, daughter-in-law of Alejandra Barrios, leader of the Mexico City Historic Center street traders who spent many years in the PRI. In all these cases, rather than being real options for a renewal process, the figure of independent candidacies was exploited by the ruling clique to perpetuate their rule and their authoritarian practices. Also as a contender is Gerardo Cleto López Becerra, former president of the Chamber of Commerce, Services and Tourism in Small (CONACOPE), who has not lost the opportunity to attack the recent mobilizations of teachers in Mexico, the largest sector of workers in Latin America. This candidate at the service of company owners has not yet developed any democratic proposal to offset the discomforts of the population, coupled with his position of echoing the policy of criminalization of social protest by the Mancera administration; his line is to support measures that criminalize social activists, youth and workers of the city, being the hallmark of his campaign the demand that the authorities regulate demonstrations and punish blockades and sit-ins in the streets. Above the legitimate right to free expression and mobilization, Cleto imposes the interests of business owners who do nothing but accumulate profits at the expense of the exploitation of their workers. The political project headed by this type of nominations does not differ from the set of traditional political parties, but rather is an extension of them. However, there are also candidates who are related to social activism, community organizations and with a history of struggle that could represent a change. First is the group “#TúConstituyente”, which was a network of five activists from organizations like Bicitekas (an organization that has promoted the use of bicycles in the city) and young people like Alfredo Lecona, who participated in the #YoSoy132 movement. #TúConstituyente was the initiative that had by far the largest echo in social networks and media and the sympathy of several intellectuals, but when they started collecting signatures, their media campaign did not succeed despite the fact that they promoted “sign-a-thons” in the streets of the city and asked for signatures through the web, managing only to get 6,000 signatures on average. There is also the candidacy of “Ciudad Feminista” (Feminist City), a union of various feminist groups who have years of struggle behind them and who do not feel represented by the current political parties. Elsa Conde, their candidate, managed to collect 85,554 signatures. Initially the INE ruled that 18,432 signatures were not found in the official register and therefore her candidacy could not be registered with about 7 thousand signatures short of fulfilling their restrictive requirements, but in a surprising turn of events, they decided to allow them to participate, although the fact that Conde’s candidacy had been approved almost two weeks before the elections set her in a big disadvantage even against other independent candidates. There was also the case of Valeria Hernández Gamudi-Grijalva, graduate from the Colegio de México with a degree in Political Sciences whose candidacy was backed by the Comité 68, an organization that groups the old activists who participated in the 1968 student movement that still demand justice for their disappeared comrades. Unfortunately, Hernández’s candidacy did not manage to get all 74,000 signatures and couldn’t compete in the elections. Lastly, the real novelty is that for the first time in decades, an anti-capitalist candidate will participate in an election in Mexico. Sergio Moissen and his running mate Sulem Estrada conform to the Anti-capitalist Slate, which is backed by the Socialist Workers’ Movement (Movimiento de los Trabajadores Socialistas – MTS, sister organization of the Argentinian Socialist Workers’ Party – PTS) that developed through years of struggle in the student movement. The MTS was created by the former League of Workers for Socialism (LTS-CC), which participated in the 1999 National Autonomous University of Mexico (UNAM) strike[[This strike was in response to the imposition of fees at UNAM, a direct attack against free education.]] with the group Contracorriente (Countercurrent), who had delegates in the General Strike Council; the LTS became associated with the “ultra” wing due to its radical positions. However, they really took off at the start of the decade, when Sergio Moissen became part of the MPJD. Later, Contracorriente and the LTS participated in the #YoSoy132 movement, which gained them the antipathy of the moderate sectors in the movement, who led a McCarthy-style campaign against them in the #YoSoy132 assemblies. In 2013, Miguel Ángel Mancera issued a rise in the cost of subway tickets from MX$3 to MX$5, which was a huge blow to the working class people, since the minimum wage in Mexico is of MX$70 (about U$6), meaning that two tickets for a day’s travel were worth 15% of that day’s earnings. Many sectors in Mexico City were outraged, and thus the #PosMeSalto movement (“#WellI’llJumpInstead”, a call to jump the subway station’s turnstiles) was born. The LTS participated in this movement as well, calling for the re-nationalization of public transport. On June 10th of that year, hundreds of activists were arrested when they attended the yearly student demonstration commemorating the massacre of students in 1971. Sergio Moissen, along with other LTS militants (many of them very young), was arrested and tortured by Mancera’s police. The subsequent campaign calling for their liberation and the amount of solidarity they received prompted the LTS-CC to become a legal organization and to register with the INE as a National Political Group, which they managed to do in 2014 after collecting over 5,000 memberships. As Joel Ortega said in an article [[Ortega, J. “Los independientes de la Constituyente: algunas lecciones”. http://www.revistaconsideraciones.com/2016/04/25/los-independientes-la-constituyente-algunas-lecciones/#_ftn3]], “although its members are not many, they are a solid militant nucleus of young convinced Trotskyists.” Taking advantage of the addition of independent candidates in elections, the MTS decided to push Sergio forward as a candidate, and it was this militant nucleus that managed to overcome the 74,000 signature threshold and hand in over 100,000 signatures. This was achieved by small groups of militants who walked through subway wagons (10 of them were arrested for this reason by Mancera’s police), visited classrooms and spoke in public plazas asking for people to support their candidate. Who are the Anti-capitalist candidates? Sergio Moissen is a professor at UNAM in the Political and Social Sciences Department. He became a member of the MTS over a decade ago, when the Oaxaca Commune was still going on. His activism began when he was studying in National High School #3, where he was organized along many of his classmates to support the UNAM strike. He studied Latin American Studies in the Philosophy Department of UNAM and is currently a PhD candidate. He participated in the MPJD in the Committee against Militarization, and in the #YoSoy132 he was a member of the postgraduate student assembly while he was studying for his master’s degree. When he participated in the #PosMeSalto movement, he was accused by right-wing journalists of having coordinating contacts with the #PasseLivre movement in Brazil. Sergio also attended demonstrations in support of the 43 normalistas, the striking Sandak shoe workers and the maquila strikers in Juárez. He contributed to the book México en Llamas (“Mexico Ablaze”), which analyzes the anti-capitalist wing of the Mexican Revolution, and compiled the book #JuventudEnLasCalles (“#YouthInTheStreets”), in which he uses a Marxist perspective to analyze numerous movements in which youth around the world took to the streets. The other member of the Anti-capitalist Slate is Sulem Estrada, who is a High School teacher in Mexico City. She graduated from the Escuela Normal Superior de México and became a referent in her school, leading several assemblies and demonstrations during the #YoSoy132 movement, during the teacher demonstrations of September 2013 and during the demonstrations against the disappearance of the 43 normalistas. She has been an activist in defense of public education for years, participating in a sit-in at the Public Education Secretariat demanding that there be no more people rejected from public schools and demanding a rise in the education budget. She is also an advocate of women’s rights, having participated in several rallies with the women’s group Pan y Rosas (Bread and Roses). 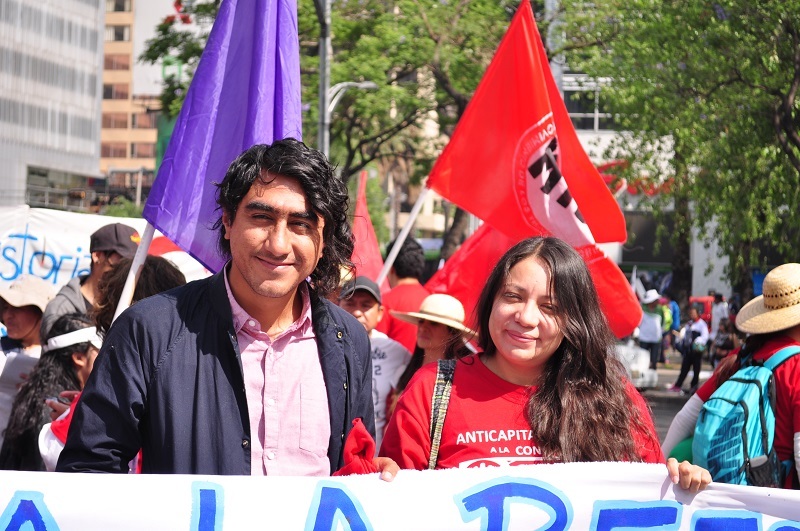 In their campaign, Sergio and Sulem have defied the three main parties in Mexico (the PRI, the PAN and the PRD); their proposals advance the needs of the oppressed people of Mexico City— demanding laws against femicides and human trafficking, for the legalization of marijuana and for unrestricted access to public higher education. They also demand that no elected official should earn more than the average teacher and that officials should be subject to recall at any time. Both teachers not only aim to enter the Constituent Assembly to challenge current political powers by expressing the voices of the oppressed. But their strength is also the result of an enormous militant activity. It is a historic event indeed that this candidacy was achieved: it is a candidacy with no links whatsoever to the capitalists nor to the politicians in power, something unheard of in the history of Mexico City. The Anti-Capitalist Platform is an achievement for the whole working class and the youth. It shows that it is indeed a political actor that is independent of all variations of the parties that only serve the capitalists and US imperialism and that is set apart from the majoritarian tendencies of the reformist and autonomist left. Let the voice of women, workers and youth be heard! Left coalition consisting of reformist parties and progressive sectors. The PRI was created in 1929 by then-president Plutarco Elías Calles under the name “National Revolutionary Party”, which was changed in 1934 by Lázaro Cárdenas to “Mexican Revolution Party”. In 1946 it was changed to its current name. The PRI governed Mexico uninterruptedly from 1929 to 2000. Officially the oldest registered party in Mexico, created in the 1930s by company owners, catholic sectors, fascists and right-wing students. “I am #132” refers to a video of 131 UIA students responding to an accusation made the day after Peña’s incident by then-PRI president Pedro Joaquín Coldwell, who labeled the students as “porros” (hired thugs or false students). Outrage at this statement led the Ibero students to make a video in which they show their student IDs to prove they were actual students opposing Peña Nieto and not a group hired by his political competitors (namely AMLO). A key demonstration of the student movement commemorating the massacre of students in the Tlatelolco housing section of Mexico City when they were attending a rally 10 days before the Olympic Games started in Mexico in 1968. Then-president Gustavo Díaz Ordaz declared himself responsible for the massacre and for all decisions leading up to it. He is remembered throughout history as a bloody repressor. Mexico City is divided in “delegations”, one of them is Magdalena-Contreras. We credit much of the following section to Joel Ortega’s article, “Los independientes de la Constituyente: algunas lecciones”, published in April 2016 in Revista Consideraciones (http://www.revistaconsideraciones.com/2016/04/25/los-independientes-la-constituyente-algunas-lecciones/#_ftn3). This strike was in response to the imposition of fees at UNAM, a direct attack against free education.